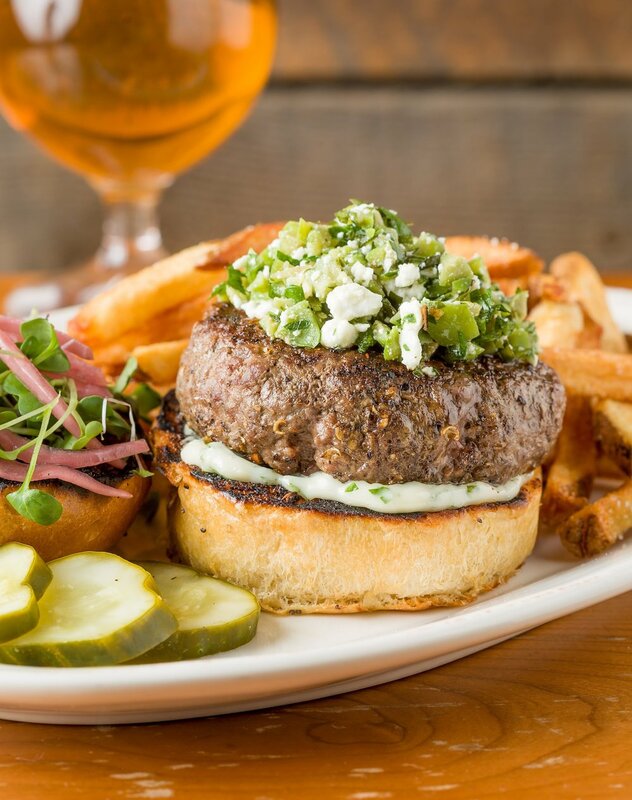 These succulent and vibrantly flavored lamb burgers have a Greek twist reminiscent of a lamb gyro pita sandwich. For the herbed yogurt: Line a fine-mesh strainer with two layers of cheesecloth. Ladle the yogurt into the prepared strainer and let drain at room temperature for 2 hours. Discard the whey and transfer the yogurt to a small bowl. Stir in the garlic, dill, parsley, and lemon juice until well combined. While the yogurt is draining, make the feta and olive relish. In a medium bowl, combine the cheese, olives, basil, olive oil, and vinegar. Cover with plastic wrap and refrigerate for at least 1 hour before serving. While the relish is in the refrigerator, make the lamb burger rub. In a small bowl, combine the salt, coriander, oregano, cumin, garlic powder, onion powder, and pepper. Set aside. For the lamb burgers: Using your hands, form the meat into five 6-ounce balls and carefully knead each ball for about 1 minute. Form the balls into 11⁄4-inch-thick patties. Sprinkle the burgers lightly on both sides with some of the rub, then let them sit at room temperature for 20 minutes. While the burgers are sitting at room temperature, heat a gas or electric grill to medium-high heat and generously brush the cooking grate with oil. Grill the burgers on one side until a nice crust forms, about 4 minutes. Using a large spatula, carefully flip the burgers and cook until a meat thermometer reads 125–130 degrees Fahrenheit for medium rare, about 5 minutes, or to your desired doneness. Remove the burgers from the grill and let rest for 2 minutes. While the burgers are resting, grill the buns. Brush the inside of each bun with butter and grill for about 1 minute on each side. To assemble, spread each bottom bun with about 1 tablespoon yogurt, or to taste. Top each bun bottom with a burger. Spread each burger top with about 2 tablespoons relish. Cover the burgers with the bun tops and serve with pickles on the side.